Welcome to the US visa and immigration blog maintained by Siam Legal’s immigration professionals. We will provide information about US immigration law, what you can expect from the visa application process and other topics related to going to the US from Thailand. Many Thais go to the US on travel, student, fiance or spouse visas and we will provide a wide range of information about applying for these types of visas on this site. The US Department of Homeland Security (DHS) reports that there were over 95,000 admissions of non-immigrant Thai citizens to the US in 2010. Of these, over 65,000 Thai travelers had tourist visas and over 21,000 had student or exchange visitor visas. The US also admitted over 2,700 Thai temporary workers and their families in 2010. Almost half of the admissions of Thai temporary workers were for those who had H1B visas (sometimes called high tech visas) for skilled workers in specialty occupations. Almost another 1,000 admissions of Thai temporary workers were for intra-company transferees holding L1 visas and treaty traders and investors holding E visas. Over 700 Thai fiances of US citizens holding K1 visas entered the US in 2010, while there were only 100 entries for Thai spouses holding K3 visas. In addition to Thai citizens traveling to the US temporarily, some Thais immigrate to the US and become legal permanent residents and US citizens. In 2010, DHS reports that over 16,000 people from Thailand became US permanent residents although only 9,384 people who were born in Thailand became US residents. The discrepancy in the numbers mainly shows up in people who became US permanent residents as refugees and asylum seekers and who may have come to Thailand from other countries. Over 4,000 Thais were sponsored by an immediate family member who is a US citizen to become a US permanent resident in 2010. We will also cover other visas and situations, like non-Thais applying for US visas from Thailand, in this blog. We invite you to take a look around as you make your immigration plans. We hope you find this information educational, but remember that this is not a substitute for legal advice about your own situation. The blog does NOT provide specific legal advice and any examples used on the site do not pertain to any specific set of facts or circumstances. Because of the changing nature of immigration law we cannot guarantee that the information in the blog is current and accurate at the time you read it. Links to third party websites are provided for your convenience and Siam Legal does not endorse or approve the content of any third party website linked from this site, nor do we have any liability in connection with any of them. In addition, this website does not create an attorney-client relationship. If you have a question, please take advantage of our call back or live chat services to speak to us and determine whether you want to retain our services. You may also submit comments or questions about blog content for review and possible publication on the blog. 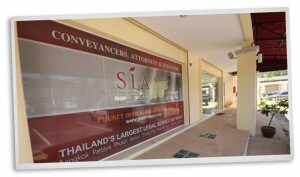 All content on this site is copyright Siam Legal International unless otherwise noted.